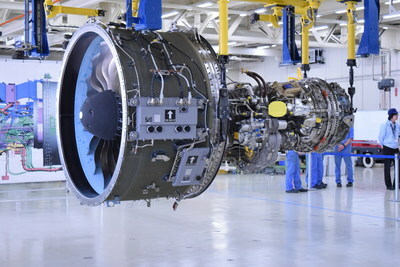 EAST HARTFORD, Conn., Dec. 12, 2018 /PRNewswire/ -- Pratt & Whitney, a division of United Technologies Corp. (NYSE: UTX), and Mitsubishi Heavy Industries Aero Engines Ltd. (MHIAEL) recently achieved a significant production milestone on the Pratt & Whitney GTF PW1200G engine, powering the Mitsubishi Regional Jet (MRJ), Japan's first jet aircraft developed by Mitsubishi Aircraft Corporation (Mitsubishi Aircraft). The first PW1200G engine assembly was completed at MHIAEL facility in Komaki, Japan, and successfully passed Pratt & Whitney's production acceptance test. The first engine produced at the facility is designated to be used in the MRJ flight test program. These are important accomplishments on the road to PW1200G production readiness. Pratt & Whitney is a world leader in the design, manufacture and service of aircraft engines and auxiliary power units. United Technologies Corp., based in Farmington, Connecticut, provides high-technology systems and services to the building and aerospace industries. To learn more about UTC, visit its website at www.utc.com, or follow the company on Twitter:@UTC. About Mitsubishi Heavy Industries Aero Engines, Ltd.
MHIAEL is MHI's group company established in 2014 by ways of company split and MHI owns an 89% stake in the company. The company's business includes development and manufacturing of aircraft engines through partnering with various aircraft engine OEMs including Pratt & Whitney, and aircraft engine MRO services for Pratt & Whitney's PW4000 engine and V2500 engine of International Aero Engines A.G. (IAE).